World 5 is the fifth world that appears in Paper Mario: Sticker Star, located east of the Decal Channel. 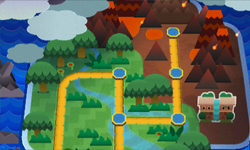 The world comprises six levels in total; It is mostly a jungle-themed world, but the last two levels have a volcano theme, similar to Worlds 5 and 8 of New Super Mario Bros. Wii, respectively. This world, along with Worlds 4 and 6, may only be accessed by using the boat at Surfshine Harbor. Spear Guys and Piranha Plants are common for the first portion of the world, and enemies such as Fire Bros. and Bony Beetles are common in the later levels. The boss of this world is Petey Piranha. The world looks similar in appearance to Neo Star from the Nintendo 64 game Kirby 64: The Crystal Shards. The first part of both worlds is a jungle-themed area and the final part is a volcano-themed area. This is the only world in Paper Mario: Sticker Star where Kamek does not appear at all. This page was last edited on October 13, 2017, at 15:06.